Games account for 51.3% of the UK entertainment market. Games accounted for more than half of the entertainment market in the UK, dwarfing video and music, according to a new report from the Entertainment Retailers Association. The report attributes much of the success of the industry to console downloads and mobile gaming. This is despite the fact that the physical market is shrinking, while digital sales grew to a “modest” 12.5 percent. “[T]he sheer scale of the games market is such that it was enough to make it bigger than video and music combined,” reads the report. 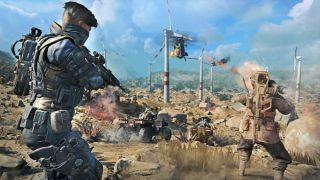 And even with physical sales being down, the likes of Black Ops 4 and Red Dead Redemption 2 still sold over a million copies on PS4 and Xbox One. But the reason the market has more than doubled since 2007 is largely down to the rise of digital. The report’s section on games is quite brief, however, and doesn’t explore what seem like more interesting changes than simple growth, namely the dominance of games like Fortnite and the increasing prominence of games as a service. The transformation even when compared to just a few years ago has been pretty huge. It wasn’t that long ago that we never had to have any discussions about loot boxes, and now they’re being talked about in government. I miss those days. "Games are big now" is kind of old news, granted, especially when they're seeping into everything and we've got League of Legends characters starting pop groups and interactive fiction being streamed on Netflix. Still, it's interesting to see how the numbers stack up against other entertainment mediums.